It was Francis Rose who, way back in 1974, first recognised the value of lichens in assessing ecological continuity in woodland. A list of seventy species was compiled by the British Lichen Society which were found to be most closely associated with ecological continuity and lack of disturbance. This list was used to arrive at the New Index of Ecological Continuity (NIEC). Added to this, a list of rarer, bonus species could be used to calculate a second index. These indices work well for much of Britain, however further indices were formulated for areas where other lichens were found to indicate continuity. Where the large and showy common lungwort Lobaria pulmonaria works well as an indicator throughout much of England, it is a common species in Western Scotland, and its presence there cannot be used as an indicator of continuity. For upland England and Wales, as well as in Western Scotland, the Eu-Oceanic Calcifuge Woodland Index is used. Further indices are used in Scotland and Western Ireland. It was noticed while undertaking a survey in Eastern Cornwall in a nature reserve known to consist of ancient woodland, that the nationally scarce lichen Heterodermia japonica occurring on a beech branch was fertile, and supported a number of small, disc like fruits or apothecia. A day or two later, there was a depression in the lichen where the fruits had been. It seemed most probable that a slug had browsed them off. Some six months later, the site was revisited, and small daughter colonies of the lichen were found up to six feet away from the parent lichen. If, as seems probably the main vector for spreading the spores of ancient woodland indicator lichens is the digestive system of slugs, then distribution is going to be very slow indeed. No slug will ever take the trouble to cross a major road simply to spread a particular species of lichen. Slugs are also ideal as vectors as the spores are conveniently attached to the substrate in their slime trail. It would be interesting to experiment by collecting slugs from known ancient woodland sites and introduce them to more recent sites to see if indicators of continuity became established. Francis Rose, and Richard Hornby of the then Nature Conservancy Council, made a list of higher plants reckoned to be associated with ancient woodland. While the clear felling of a wood totally removes the corticolous lichen flora, higher plants are more robust, and are therefore useful in assessing ancient woodland sites. It is most important to remember that the higher plant list consists of common species, and that it is the total of species present that is significant. The absence of rarer species lacks significance just as does the presence of one or two of the common indicators. Higher plant indicators are all photosynthetic, and therefore need adequate light levels. In many ancient woodlands, due to the current lack of grazing, the ancient woodland flora is confined to rides, or to the roadside banks of the edge of woods. The British Bryological Society have also made a list of mosses and liverworts most closely associated with woodland continuity that works well and I understand that in the insect world, similar lists of beetles and hoverflies have been made. It would be most interesting to know if there are correlations between all ancient woodland indicator lists. One of the difficulties of using lichens, and to a lesser extent bryophytes as indicators of ecological continuity is their sensitivity to air pollution. Throughout most of Central and South-eastern England until some thirty years ago, acid rain and industrial pollution all but destroyed the lichen flora totally, and with it the information it could give. 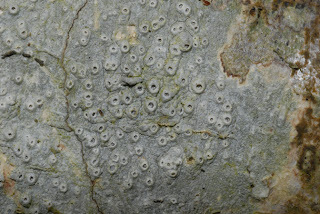 It is lucky that the Barnacle Lichen, Thelotrema lepadinum, which is a most useful indicator, is relatively tolerant of sulphur dioxide in the atmosphere, and it has been found, as would be expected due to the ecological continuity of the sites, in both Epping Forest and Hatfield Park. Even low lichen indices of continuity in these areas can be treated as significant. 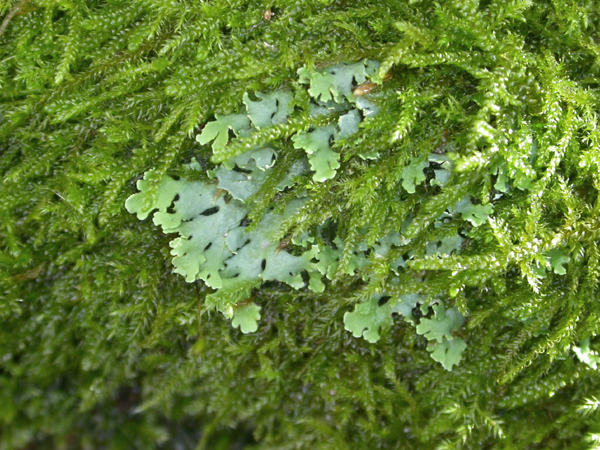 Most of the early work that related lichen richness with ecological continuity took place in the deciduous woodlands of England, Wales and North-western Scotland. In Central and Eastern Scotland there are pine forests of great ecological importance and continuity. 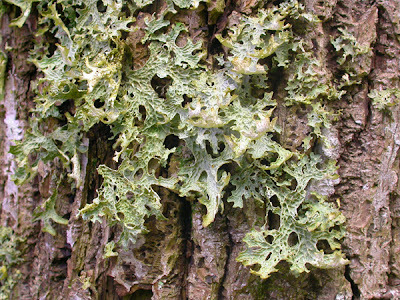 The lichen flora associated with these trees is very different, as are the habitats they provide. Dr Brian Coppins, the foremost Scottish lichenologist, is known to say that the only good pine tree [for lichens] is a dead pine tree. He points out that a pine provides habitat for lichens for a longer period as a standing dead tree than it does when alive. While coppice woodlands with hazel or hornbeam in England can be important for lichens, and the coppice poles can support a rich flora, this is nothing compared with the incredible richness found in a few very important and ancient hazel woodlands in western Scotland and in the Hebrides. A further index using lichens is also used, but these days only occasionally. This is the Revised Index of Ecological Continuity (RIEC). In this case thirty species are used, and by multiplying the number of species by 5, a figure for the index is found as a percentage. A score of 100% is reckoned to equate to a wood with perfect ecological continuity. However scores higher than a hundred are possible such as Glen Shira in Scotland with a score of 130%. Using the New Index of Ecological Continuity, a total of thirty or more species that includes bonus species is thought to indicate a wood of high conservation value. Parham Park which is arguably the best example of ancient woodland in Sussex has a total of 27 NIEC species added to which should be 3 bonus species bringing a total score of 30. In other parts of Britain, much higher totals are found. Francis Rose was never keen to indicate the meaning that should be given to higher plant indicator totals. However, he told me he was of the opinion that a score below twenty species indicated a wood of low conservation interest. Similarly a score of twenty bryophytes indicate conservation value, though this is reduced to fifteen throughout South-eastern England. 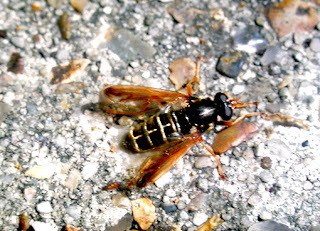 Some groups of insects also contain species that are good as indicators of ecological continuity. Two groups certainly spring to mind which are hoverflies and beetles. Two illustrated here are the rare New Forest hoverfly Calliprobola speciosa which could be used, as could the beetle Helops caeruleus. 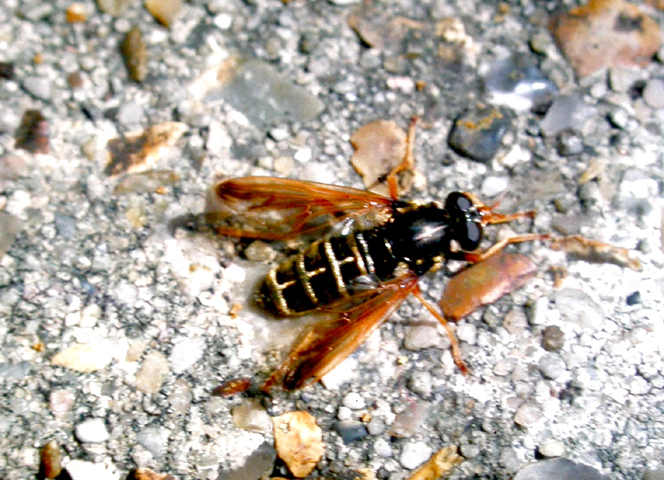 There are many more hoverflies and beetles that could be used as indicators of ecological continuity. This account has been to do with ancient woodland with continuous canopy cover. This type of woodland is not rich in butterflies. For butterfly richness, it is the woodland rides and their floristic richness that are important. 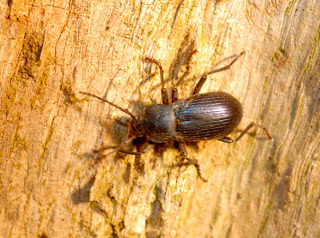 Woods such as Bernwood in Oxfordshire are soft wood plantations, but the richness of the rides make them outstanding for insects such as butterflies. Beautiful bluebell woods are not examples of woodland with long continuity, but are none the less very important. Similarly, it is coppiced woodland that generally provides habitat for greatest flowering plant biodiversity. It is a balance that is required as well as the importance that is given to woodland with a long history.